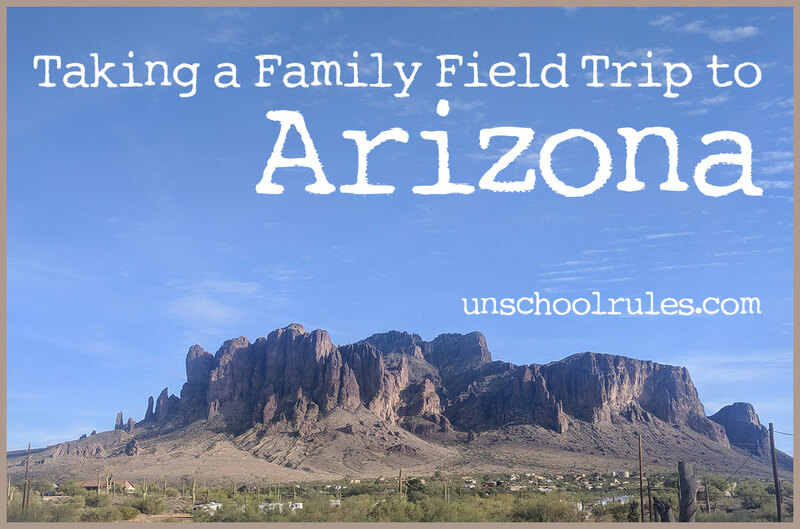 Note from Joan: This post comes completely courtesy of my fiance, Dan, who embarked upon an epic Arizona field trip adventure with Sarah, made notes about the whole thing and then wrote them up for Unschool Rules. He’s a keeper. Most of America’s really flat. In case you didn’t know. But some parts are nice and pointy. Originally, the plan was for Joan, Sarah and me (Dan) to head to Arizona to see my parents and my brother, Dave. When Joan’s mom, Sarah’s “Mommom,” fell and broke her hip in December, it meant that she needed to have some help at home, and Joan graciously volunteered to stay behind. So Sarah and I spent the last half of December and the first part of January driving across the country, barely beating the snow one way and getting through a light dusting coming back. 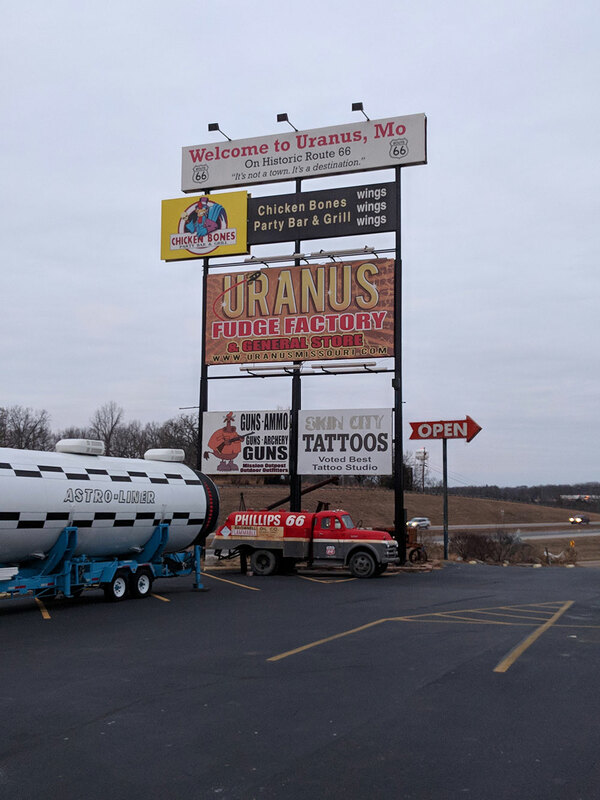 We saw some cool things, we saw some weird things, and you’d better believe we stopped at Uranus, because everyone knows the best fudge comes from Uranus. That’s Rivers the bear holding Merlin. On the way West, we tried to keep a decent pace so it wouldn’t take us too long but weren’t rushing through by any means. 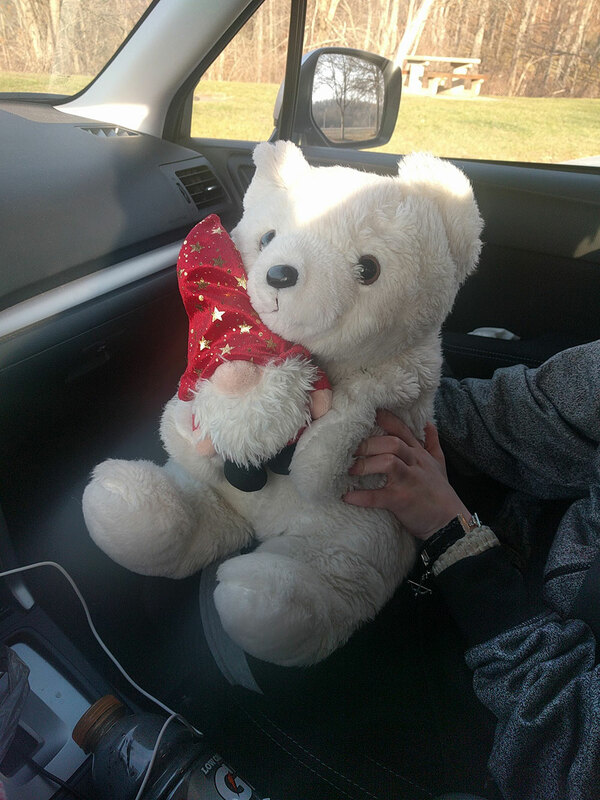 I think we made it all the way to Friendsville, MD, before we stopped at a roadside store that sold all sorts of knickknacks, and we picked up a wizard for the journey (his name’s Merlin, obvs). Our very first night out we just about made it to Lexington, KY, and at the time there was a wee bit of a blizzard on the way. We just saw some snow blow across the road for about a mile, but the snapshot Joan took of the weather shows just how close we were. In one cool story from their travels, while in Lexington, Kentucky, they found a bag of clothes and a blanket, probably left out for someone homeless. But no one was around, and the weather was bad, and they didn’t want it all to get wet. So they put it in the car, and then, when they made it to St. Louis, Missouri, they found a man asking for help on a median near a Starbucks and were able to give it all to him. 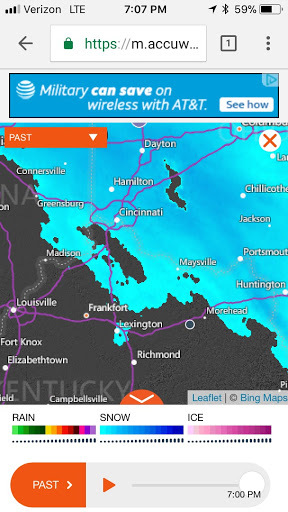 So, if you’re reading this and you left such a gift in Lexington, know that it still helped, many miles away! We tried listening to some podcasts to break up the monotony, but we didn’t really have any that were jazzing us up all that much, so at some point we switched to listening to The Walking Dead: Rise of the Governor. Sarah, of course, is a huge Walking Dead fan, so she really enjoyed the background information provided. I thought the story was interesting and really gave you something to think about, although the writing left something to be desired. We went out of our way find interesting things along the way, though we also kept in mind that every five minutes we spent not driving directly west was 10 more minutes we’d have to spend driving to get to Arizona. We, however, could not resist Uranus. It’s a Route 66 stop in Missouri that’s designed to make sure everyone in the family can find something fun to do. There’s a big store with all manner of tchotchkes and gewgaws to buy, but they also have a full candy store (hard candy and fudge). They also have a bunch of neat things on the walls, from legitimate taxidermy to oddities like a two-headed goat and a “real” mermaid skeleton. A big ol’ model train ran around the top of the inside of the store to keep your eyes moving and looking at everything on display. Sarah was a big fan of the saloon building (the complex was made of interconnected buildings, and each was designed to look like a building in a Western — the saloon, the burlesque house, you name it), and we both liked the “funkyard,” which was a play area with cool old cars, a double-decker bus, and OH YEAH it was 15 degrees out so we didn’t do much by way of playing. We stopped in Kansas City long enough to go see the new Jumanji, which was pretty dang funny. In Oklahoma City, we hit up a few antique stores, both to poke around and find some late Christmas gifts for my parents. We were pretty wiped out by the time we made it to Arizona, but we had lots of fun once we rested up. My parents know all the good spots, so we went to the Goldfield Ghost Town in Apache Junction. 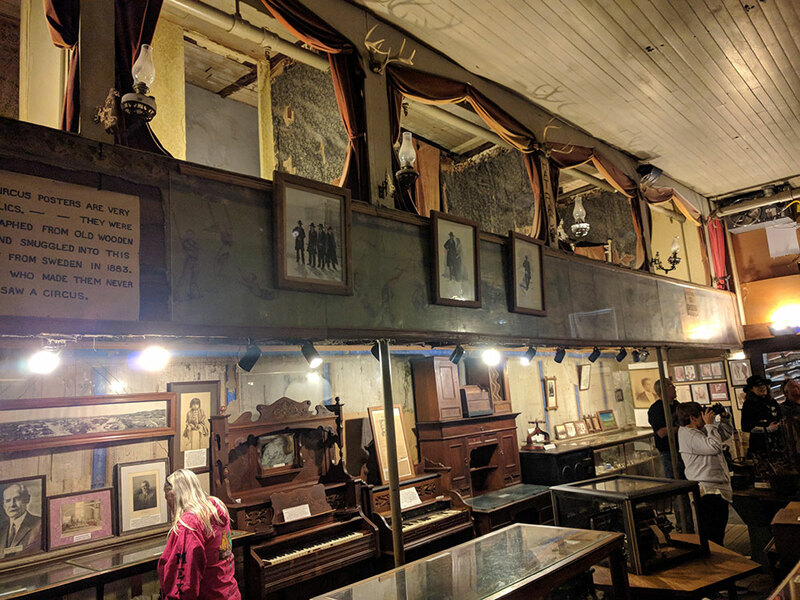 It’s a campy little place with “authentic” Old West buildings, but what Sarah REALLY loved was the Superstition Serpenterium (which is a fantastic name, by the way). 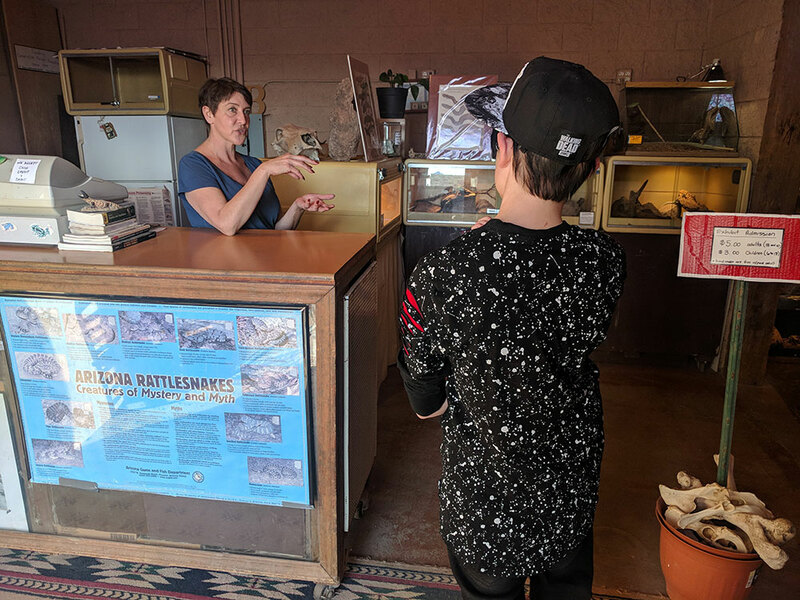 At the Superstition Serpenterium, Sarah got to talk with owner Calleen Dunbar about her awesome collection of snakes, spiders and more. The woman who runs the place, Calleen Dunbar, owns and takes care of all the animals by herself, along with her husband. She has dozens of snakes, lizards and other reptiles on displays, in addition to Sarah’s all-time favorite, the spider. Calleen was very gracious, and talked with Sarah for nearly half an hour all about different facts about spiders and hers in particular. Both Sarah and I were mindblown to find out that when the spider sheds its carapace after molting, it basically leaves most of what we consider a spider behind! Nope. Nope nope nope. But Sarah loves spiders, so this was super-cool for her. 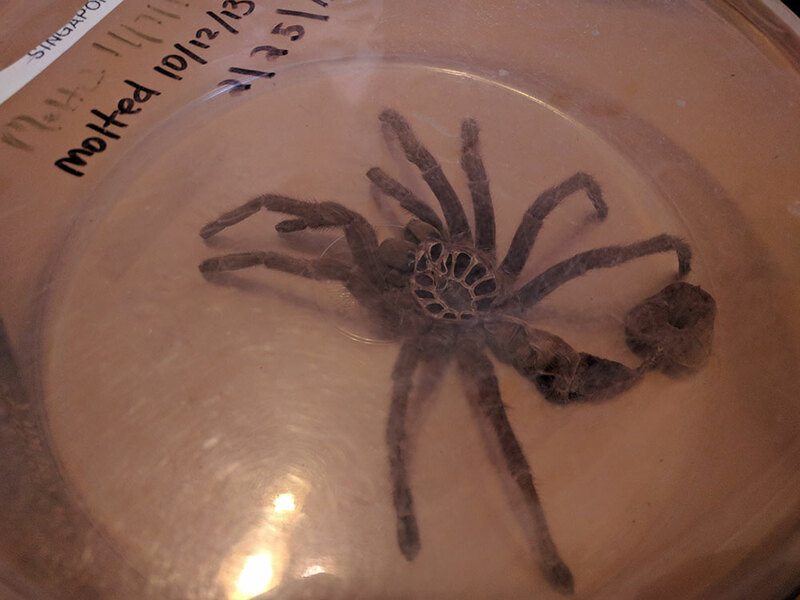 So we were both super interested in the spider’s exoskeleton, and spent a lot of time trying to figure out how to make one for humans (spoiler alert: didn’t work). So a big thanks to Calleen, and a big recommendation from us if you’re ever in the area! Another highlight of the trip was going to see Tombstone, Arizona. Tombstone has been made famous by the Gunfight at the OK Corral, and while there were lots of cool gunfight reenactments and such, the place we spent the most time at was the Birdcage Theatre. It’s the only building still standing from when Tombstone was a boomtown, having been built in the 1880s. I think it’s hard for East Coast people to understand, but I still totally geek out whenever I get the chance to see something that’s been around for a hundred or more years. It seems kind of odd (since, on the East Coast, there are plenty of buildings that were around during the Revolutionary War some 200-plus years ago), but I lived on the West Coast until I was 25. On the West Coast, there really aren’t that many permanent structures still standing, since proper buildings that could stand up to the weather/earthquakes/time weren’t constructed until just shy of 100 years ago. At the Birdcage Theater in Tombstone. So I was suitably fascinated to see the booths that had the original curtains still hanging in them, as well as all of the old stuff. The Birdcage’s history is really interesting — they shut the place down and locked it up tight in 1889, expecting to come back in a few years … but it stayed closed until the 1930s, when someone else bought it. Luckily, enough time had passed that they realized the historical value of the place, so it’s been operating a museum basically since it shut down. That means there’s lots of detritus, clothes, furniture and the like from the original period. Sarah, Dave and I went on a “ghost tour” of the place, where they take you around for a tour at night and then you sit in the backstage area for 20 minutes with the lights off. Our tour guide was very good, but I personally didn’t hear much that sounded like anything other than timbers creaking. Dave, Sarah and I also went out in the desert in my parents’ Jeep. (Sarah says going out in the “boneyard,” as it’s called, was her favorite part of the trip.) There’s a lot of off-road driving opportunities, even right next to the retirement community where they live. We even found some old bones (we assume cow) that we got to take home. My mom, Sarah and I also took the time to go see Kartchner Caverns in the southern part of the state (coincidentally like half an hour away from Tombstone). That’s another place with a really interesting backstory: Two guys were just out in the hills, looking for caves, when they stumbled upon this amazing cave system in the ’70s. They were able to keep it secret long enough to have the land owner sell to the state, so the state could step in and preserve the caverns while still giving tourists access. There are lots of rules, like not being able to bring cameras or even coats (because of the lint! ), as the cave system is still “alive” and they don’t want to mess with the ecosystem. But all good things must come to an end, so eventually we had to pack up and head home. But first! Sarah and I wanted to stop just outside of Flagstaff at a place called BEARIZONA. 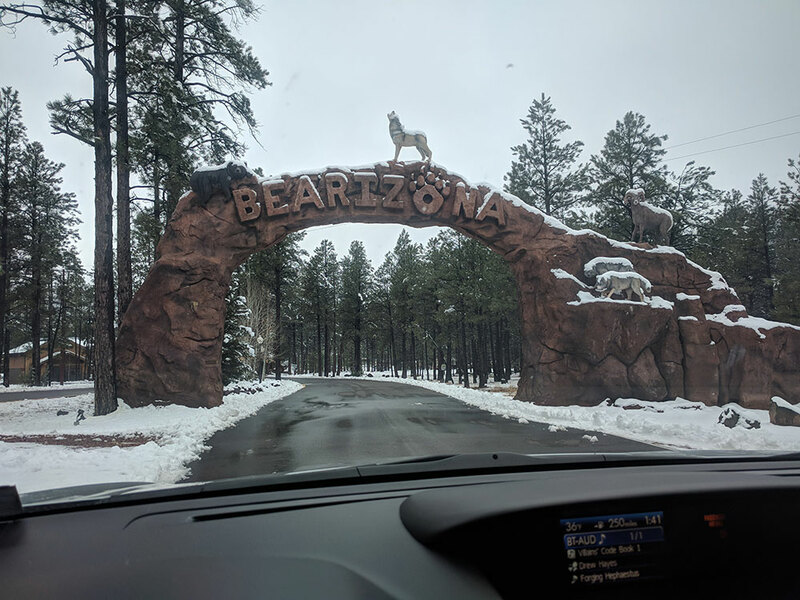 As the name implies, Bearizona is a wildlife refuge. There are two parts of the park — the first (and my favorite) allows you to drive your car through areas where different types of animals live. They have wolves, bears, bison and all manner of creatures (including some of the biggest crows I’ve ever seen. I would NOT have been surprised to see one swoop down and take off with one of the wolves). It’s a little bit terrifying-and-awesome to see animals that large and dangerous that close. Some of the signs warned that the wolves and bears sometimes like to take souvenirs off cars (pieces of the bumper and what-not), so not to let them too close. DON’T WORRY, SIGN. We weren’t exactly planning on going for a stroll. The second part of the park was a more traditional zoo-type experience. 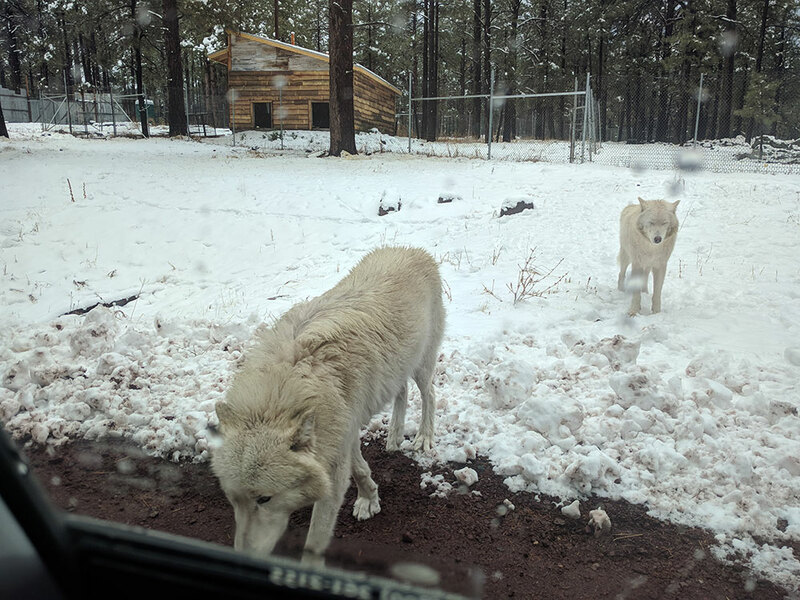 They had lots of animals (despite it being the middle of winter with snow on the ground) that were for the most part out and active. There also were two peacocks just roaming the grounds, doing whatever they pleased (mostly hanging out by the food court area hoping for food. Joke was on them, since it was closed). 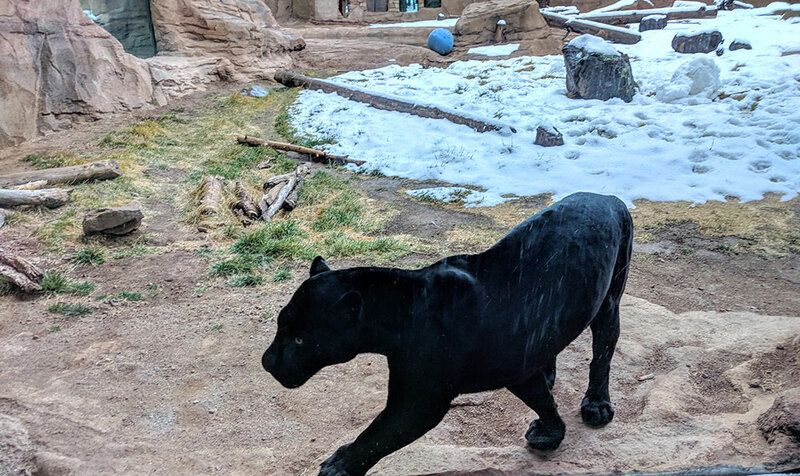 The coolest and probably most unexpected part of Bearizona was the PANTHER exhibit. Bearizona is also home to this amazingly large panther. That is a MASSIVE cat. It just looked so powerful strolling around its enclosure. Sarah and I were both surprised to see that you could actually see spots on its coat — despite looking all black, you can see slightly lighter black lines that outline its spots. You totally can’t see it in the photo of course, but it’s really neat. On the way back, we mostly just drove through, as we were in kind of a hurry to get home. 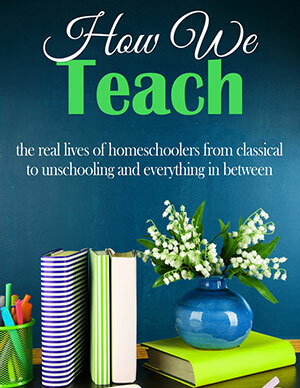 We did switch off the Walking Dead (because, honestly, there was only so much murder I could stomach) and listen to Forging Haephestus, by Drew Hayes. Drew’s one of my favorite authors (mostly because of his Super-Powereds series, which just concluded). This story gave Sarah and I the chance to talk about what it means to be evil, or a bad guy, and how sometimes being a good guy doesn’t stop you from doing bad things, and some bad guys are bad just because of how they’re perceived rather than who they are or what they do. Lots of opportunities to explore gray areas! Also one of the main characters’ super power is he can summon items from video games and use them in the real world. So that’s pretty neat. 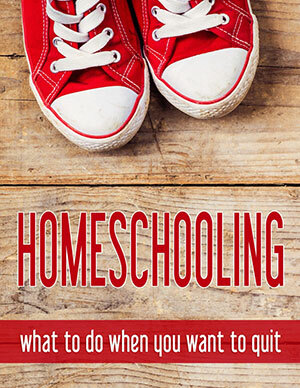 This entry is about family, geography, history, homeschooling, museums, trips, unschooling. 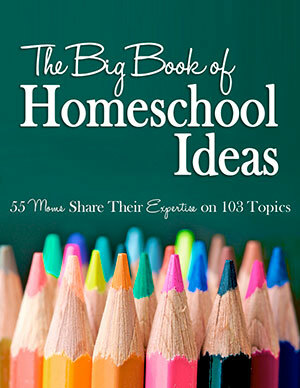 The previous post was Building an American history timeline, no textbooks required!. 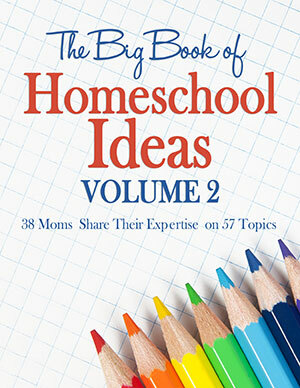 The next post is Awesome unschooling gift ideas. I really enjoyed that! Thank you for sharing! Love the pictures, too. Glad you had a great time! 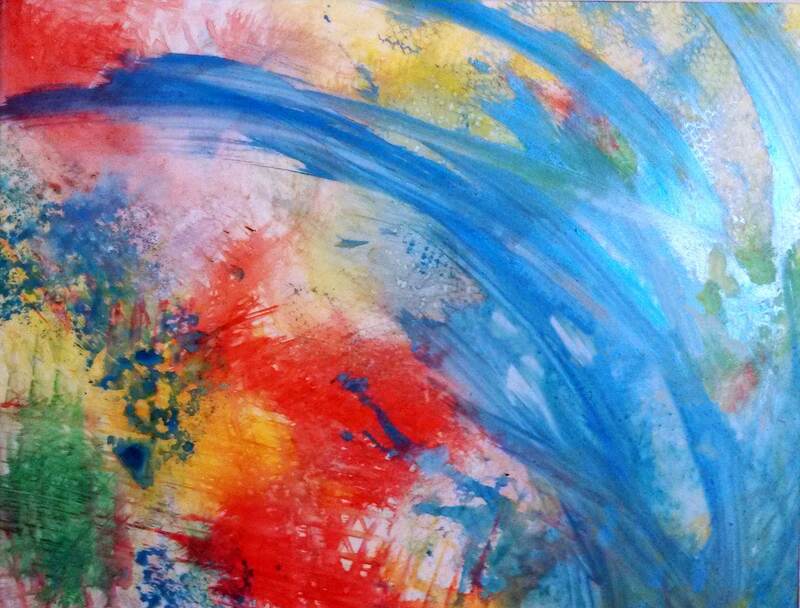 Dawn, I’m so glad you liked it! They had such a great time.